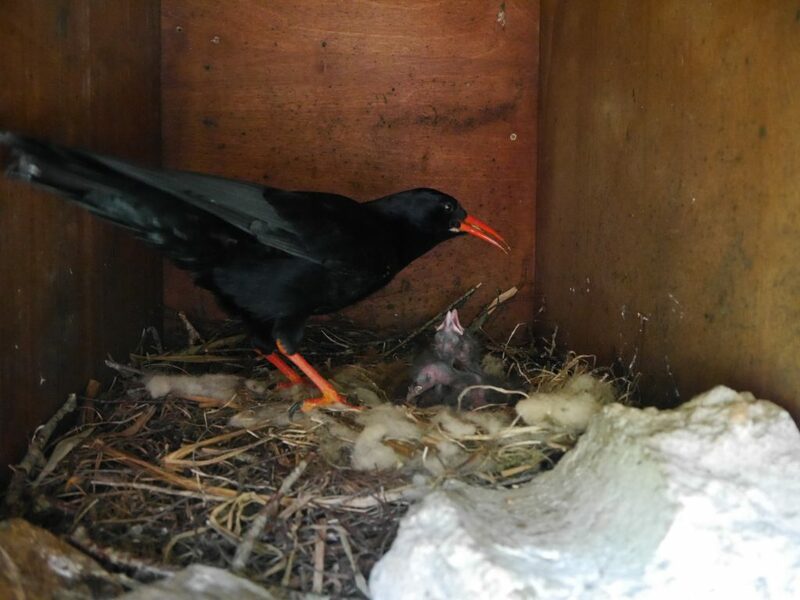 Despite a turbulent start to the breeding season the choughs at Durrell had their most productive year to date. We took a slightly different approach to our management of the pairs this year and it seems to have paid off. We left Issy and Tristan to parent-rear in the display aviary. Out of the three pairs we have, they were the most likely candidates to succeed here despite the aviary being on-show and susceptible to disturbance. We would, of course, step in if the need arose, but in the end all they needed from staff was a constant supply of food. 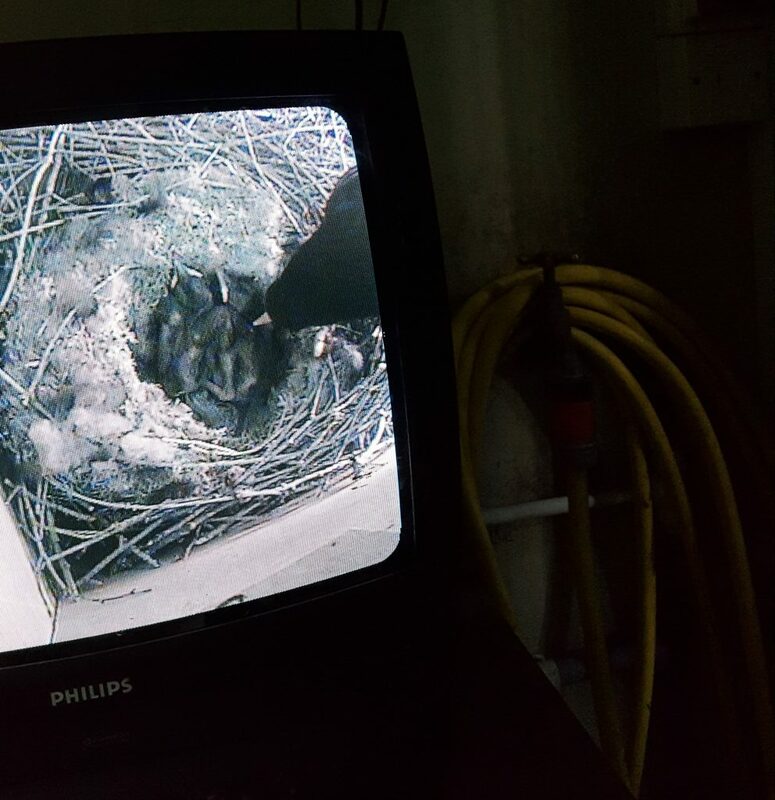 Issy’s clutch of eggs visible on the nest camera monitor. Photo by Liz Corry. Issy laid four eggs in total. 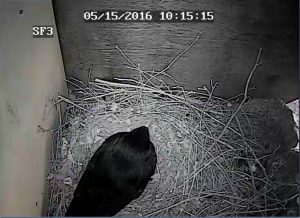 On 6th May the first two eggs hatched. The chicks looked healthy and the parents were very attentive. The following morning a third chick was visible on the nest camera although it was not very active. Sadly this last chick did not live very long and by the end of the day the parents had removed the dead chick from the nest. 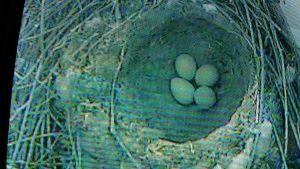 The fourth egg stayed in the nest for a few days. When it was apparent it was not going to hatch the parents discarded it and focused their efforts on raising their two chicks. We have been successful in the past with chicks hatching under their parents. However, the few chicks we have had only survived for a few days to a week at the most. Understandably staff were nervous. Visitors to Durrell may have questioned why the aviary was so overgrown when our signage clearly states that choughs require short-cropped grassland. The simple response is “Would you want a large animal with a noisy strimmer spewing grass, thistles, and weeds in front of your baby’s cot?”. 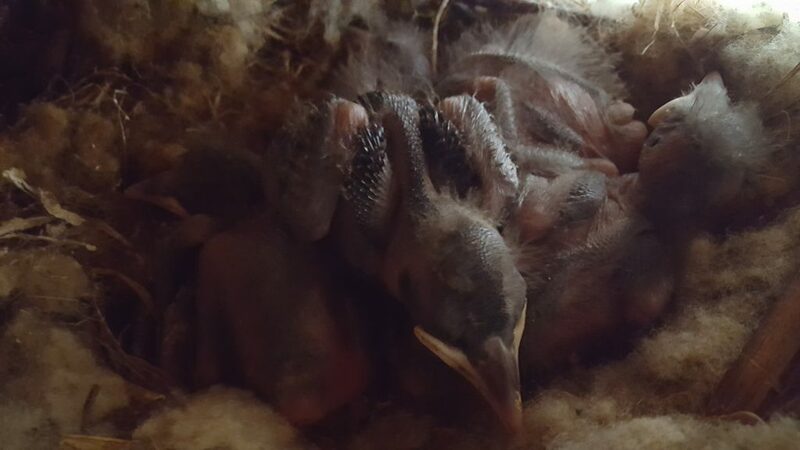 We didn’t want to do anything that would distress the parents and could lead to the nest being abandoned. 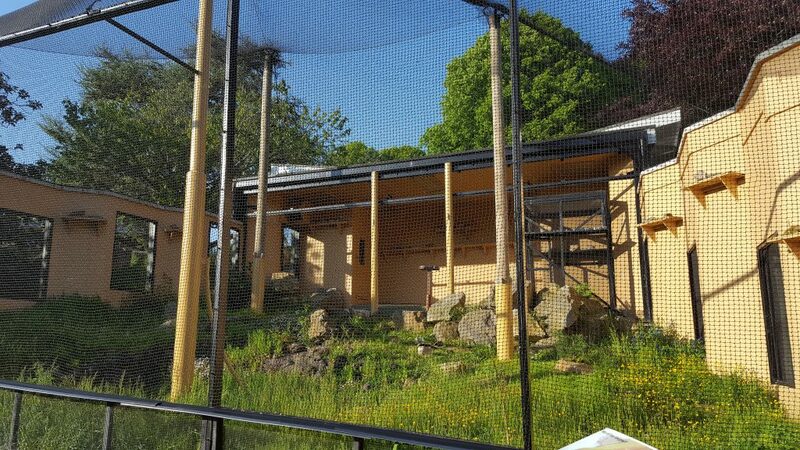 The on-show display aviary became the breeding aviary for Tristan and Issy this month. Photo by Liz Corry. 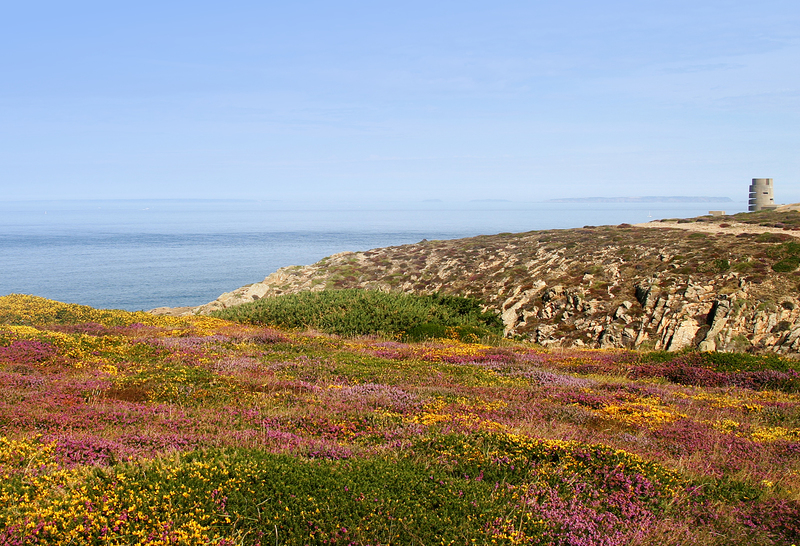 However, we do need the birds to be able to forage naturally so the chicks can learn skills for surviving in the wild. The solution was to wait for the chicks to be a couple of weeks old, i.e. past the critical stage, and go in at feeds times with hand shears. Spending five minutes here and there trying to keep on top of things until the family are accepting of a ‘large animal with a strimmer’. By the 24th, the chicks were almost adult-sized with feathers head-to-tail. They had reached a milestone never achieved at Durrell before. To mark the momentous occasion we gave them leg rings. More out of need than celebration. The best time to add rings and obtain DNA for sexing is when the chicks are three-weeks old. We assigned names to the chicks following the alphabetical system of previous years. These chicks will be S and T. Full names will be given once genders are known and they have been moved up to Sorel which should be in July. The story proved to not be as straightforward for the other pairs. We anticipated problems based on previous experience and the fact that we had a new pairing. The plan for these pairs was to allow partial parental incubation then remove eggs to artificially and/or foster incubate the remainder of the time. Once hatched, the chicks would be hand-reared for the first five days before recruiting Gianna to help foster rear until they fledge. Using Gianna as a foster mum helps reduce the chance of the chicks imprinting on the keepers. It also means we get out of having to do the early morning and evening feeds as Gianna can take care of them. Both pairs laid a clutch of four eggs. This is where it gets complicated. We rescued one egg from Gwinny before her partner had time to do any damage. Once he was relocated she laid another three which we left with her. We only managed to recover two eggs from Mrs Denzel. All three rescued eggs were given to Gianna to carry on incubating. Gianna was already incubating three infertile eggs of her own so we simply swapped them over. Since Gianna is very tame she was very accommodating to staff when they needed to weigh and candle the eggs to check on progress. We were not so sure how Gianna would cope with hatching eggs having never experienced it before. 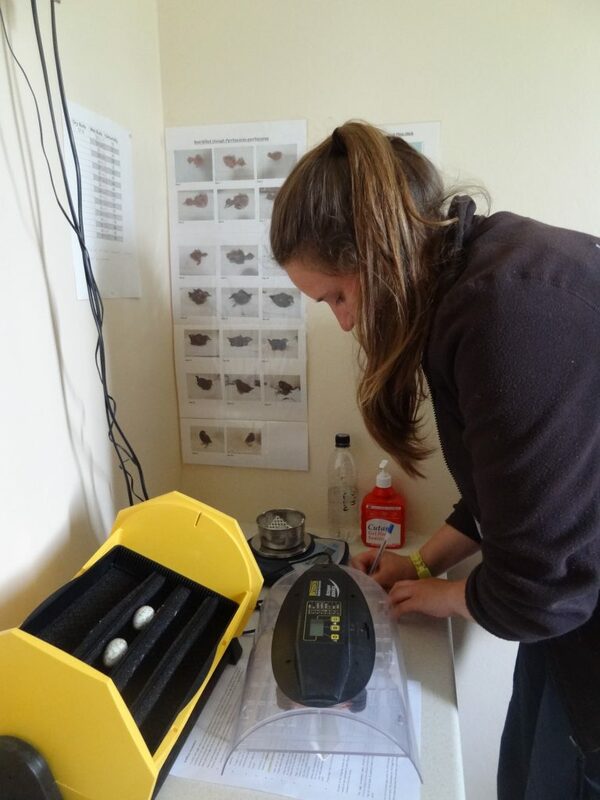 To optimise everyone’s chances we relocated the eggs to the incubator at the Bird Department on 18th May a few days prior to hatch date. We gave Gianna dummy eggs to ensure she continued sitting until the time was right to start fostering. Following so far? All this time Gwinny had been incubating three of her own eggs. On the 18th we went to her nest to candle the eggs and found that all three were fertile and on-course for hatching. Gwinny has looked after hatchlings before, but never succeeded in getting them much beyond that stage. Without a male to help feed her and the chicks we were concerned the odds would be against her. However, we wanted her to have a chance and gain the experience. We took two of the eggs back to the incubation room and left her with one in the hope that she would cope with having just the one chick to feed. With five eggs in the incubator (three belonging to Gwinny and two belonging to Mrs Denzel) it might give the impression that the next bit was just a breeze. Sit back and wait for the eggs to hatch. Alas no. To summarise, it feels like an injustice to the work the keepers put in, but to save on digital ink lets just say we had to assist all but one of the eggs. A few had ‘holes’ drilled into the shell to increase air-flow. Two were assisted at hatch because the chick was struggling to do so alone. 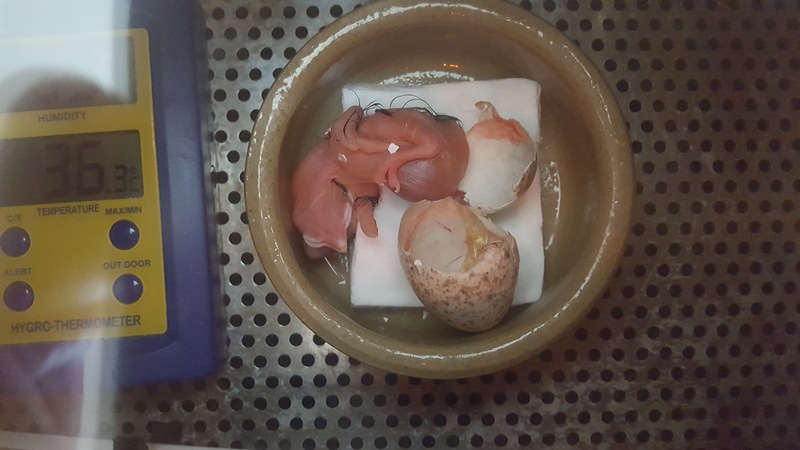 One egg sadly didn’t make it to hatch because the chick was badly malpositioned and unable to even attempt to break free. 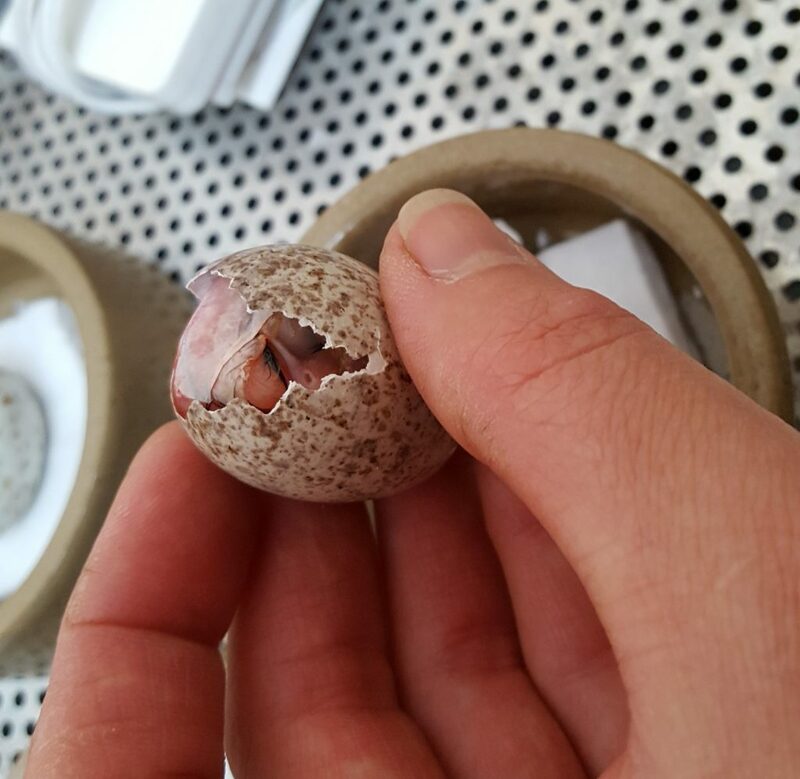 A small hole was ‘drilled’ into a chough egg to aid successful hatching. Photo by Liz Corry. 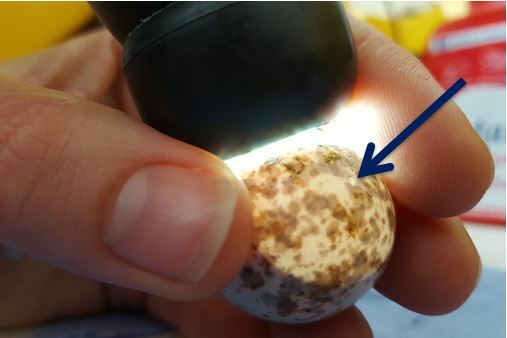 The first egg to hatch in the incubation room did so on the 21st. 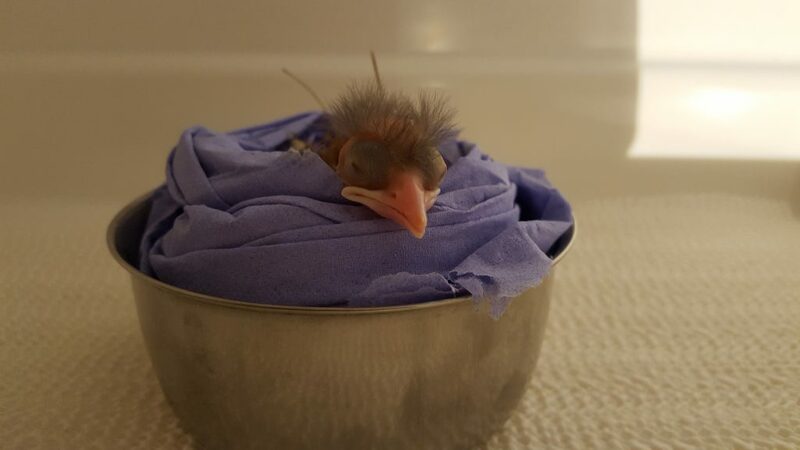 Two days later there was a second and the following day, with some help, the final two hatched. In order of hatching the chicks were named U, V, W, and X in hope that all four will succeed and make it to Sorel. Assisted hatch at Durrell. Photo by Liz Corry. A chough chick seconds after hatching at Durrell. Photo by Liz Corry. The egg left with Gwinny failed to hatch. 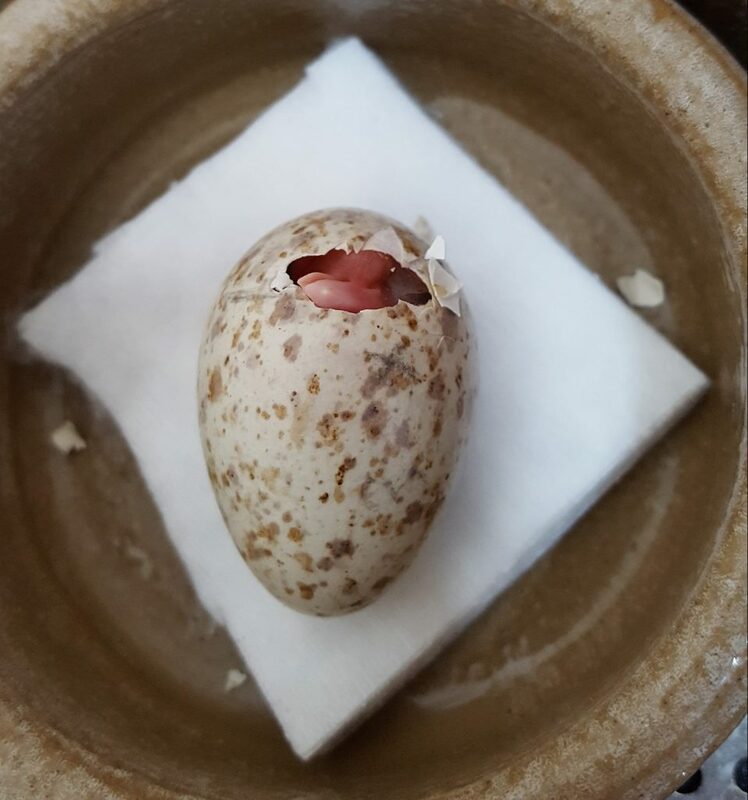 She remained incubating it for a long time after the due date, but eventually gave up. The egg was taken to the Vet Department for a post-mortem. Chicks U, V, W and X were hand-fed using tweezers every hour quickly progressing to every two hours as they grew. Feeds began at 6am and finished at 11pm. The chicks were healthy and developing well. When the first chick was five-days-old we relocated it to Gianna‘s nest where she had been patiently waiting. Within three days all four chicks were in the foster nest with Gianna. Foster mum Gianna helped with feeding the chicks once they reached five days of age. Photo by Liz Corry. 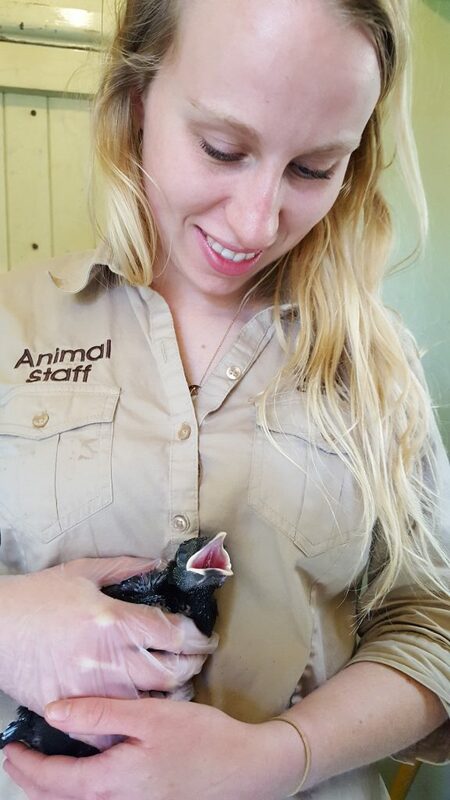 Myself and Bea, the chough placement student, took turns feeding the chicks and Gianna. Five feeds a day from 7.30am until 5.30pm. Gianna carried out the remainder of the feeds. Occasionally trying to feed us too! Luckily Gianna took responsibility for cleaning the nest and disposing of the faecal sacs. In turn we had to clean Gianna before a new species of white-billed chough evolved. There was a slight worry on the second day of chick V being in the foster nest as it was looking lethargic and had not put on any weight. Chick U had put on weight and was obviously being fed by Gianna. As a precaution V was moved into a heated brooder and regularly hand-fed for the rest of that day. It was then returned to the foster nest before the last feed to spend the night with Gianna and its sibling. The next day V had improved so it stayed in the nest and we target fed that chick whilst Gianna looked after the others. Regular monitoring of the chicks meant that we could quickly see and react to anything untoward. Fortunately for the rest of the month there were no concerns. With a fledging period of 42 days there is still a long way to go. The ‘fab four’ chough chicks in their foster nest. Photo by Liz Corry.